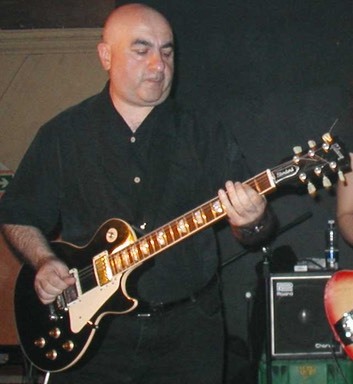 Pete Farrugia BA Hons, Dip Mus is an experienced, qualified, CRB-checked private guitar tutor based in Carshalton with a strong live music background playing in popular London bands Shout Sister Shout and�Saucy Jack. Pete was given professional tuition by several tutors, studying classical guitar under Peter Rubie while still at school and later taking lessons in jazz guitar from Martin Jackson and has years of experience and knowledge gained from studying musical theory. "I really enjoy helping students learn to love playing the guitar while teaching them good technique," says Pete. "While it is true that some excellent famous guitarists have been self-taught, this is the exception not the rule! Most people, even if they show exceptional talent, need help to achieve their true potential." "I try and make sure that bad habits don't get adopted, which if left unchecked can hold back your playing for the rest of your life," adds Pete. "An experienced tutor can save you years of struggle and help you to achieve your goals as quickly as possible." If required, Pete offers entrance and coaching for the Registry of Guitar Tutors exams. These are graded from beginner up to diploma level. They are awarded by the London College of Music and certified by the University of West London. The exams are fully accredited by Ofqual and UCAS points are available for grades 6, 7 and 8. RGT exams are available for electric, acoustic, bass, classical and rock guitar styles. Pete's intensive study of the history of music enables him to add interesting details to lessons, putting example pieces into their proper historical context and demonstrating the development of different musical genres and playing techniques. Songs and instrumentals are provided using chord charts, tablature and traditional musical stave notation and Pete can teach sight-reading if required.�Audio-visual aids are an important part of each lesson, from original sound recordings and backing tracks, to videos and even music software like Pete's own 'Practice Pal'. Pete has a huge collection of printed handouts for students, covering songs, instrumentals, exercises, music theory and history. "I use printed handouts from a collection that I have built up over many years," explains Pete. "I also use clear diagrams to display scales, chords and arpeggios." Pete's extremely varied collection of specially-arranged example songs date from early 20th Century blues, right up to date, and pretty much everything in between. So if you would like your child to learn guitar with a talented, experienced and passionate local musician - or would like to learn to play yourself - why not give Pete a call?